To refer to the market capitalization of a company. To refer to the model that the main goal for a company is to increase the wealth of its shareholders (owners) by paying dividends and/or causing the stock price to increase. Currently, shareholder value approach reveals to a contemporary management philosophy, which suggests that an organization measures its success by inspiring its shareholders. Shareholders or stockholders are individuals or institutions that owns in a lawfully form shares of a corporation. They are considered to be a subgroup of stakeholders, which are all individuals or communities, who have a direct or indirect interest in the business entity such as suppliers, customers, government, and competitors. The idea of the shareholder approach tries to increase the organization's value by increasing firm's earnings, by increasing the market value of corporation's shares and by increasing also the frequency or amount of dividend paid. Additionally, many business analysts stated that shareholder value approach provides managers with clear mission and it enabled decision making. Principally, the idea that shareholders' money should be used to earn a higher return than they could earn themselves by investing in other assets having the same amount of risk. The term, shareholder value was originated by Alfred Rappaport in 1986. There is more pressure on corporate directors to measure, manage and report the creation of shareholder value regularly. In the emergent field of shareholder value analysis, various measures have been developed that claim to measure the creation of shareholder value and wealth. Value creation means creating value for shareholders. Value creation should be the focus of all the metrics. When organization creates value for shareholders, it means that they are creating value for all the stake holders. Creating value for shareholders is now extensively recognized corporate objective. The interest in value creation has been motivated by several developments. Capital markets are becoming progressively global. Investors can willingly shift investments to higher yielding, often foreign, opportunities. Institutional investors, which usually were inactive investors, have begun exerting influence on corporate managements to create value for shareholders. Corporate governance is instable, with owners now demanding liability from corporate managers. Manifestations of the increased assertiveness of shareholders include the need for executives to justify their compensation levels, and well-publicized lists of underperforming companies and overpaid officials. Business press is highlighting shareholder value creation in performance rating exercises. More focus is to link top management compensation to shareholder returns. Several economic theorists asserted that value is created when management produces revenues over and above the economic costs to generate these revenues. Costs come from four sources such as worker wages and benefits; material, supplies, and economic devaluation of physical assets; taxes; and the opportunity cost of using the capital. Under this value-based view, value is only created when revenues surpass all costs including a capital charge. This value accumulates typically to shareholders because they are the residual owners of the firm. Shareholders assume management to produce value over and above the costs of resources consumed, including the cost of using capital. If dealers of capital do not receive good return to compensate them for the risk they are taking, they will take out their capital for better revenues, since value will be lost. A company that is destroying value will always fight to attract further capital to finance growth since it will be constrained by a share price that stands at a discount to the underlying value of its assets and by higher interest rates on debt or bank loans demanded by creditors. Shareholder value creation infers continued creation of shareholder wealth through annual dividend receipts and share price appreciations. Wealth creation is defined as the changes in the wealth of shareholders on a periodic (annual) basis. Applicable to exchange-listed firms, changes in shareholder wealth are inferred mostly from changes in stock prices, dividends paid, and equity raised during the period. Since stock prices reveal investor anticipations about future cash flows, creating wealth for shareholders needs that the firm undertake investment decisions that have a positive net present value (NPV). Though these terms are used interchangeably, there is some difference between value creation and wealth creation. The value standpoint is based on measuring value directly from accounting-based information with some adjustments, while the wealth viewpoint depends mainly on stock market information. For a publicly traded firm, these two concepts are alike when management provides all relevant information to capital markets, and the markets consider and have confidence in management. Capital markets are becoming progressively international. Investors can voluntarily shift investments to higher yielding, often foreign, opportunities. Corporate governance is instable, with owners now demanding accountability from corporate executives. Exhibitions of the increased assertiveness of shareholders include the necessity for executives to rationalise their compensation levels, and well-publicized lists of underperforming companies and overpaid executives. Managers are concerned with self-preservation. Well-publicized hostile takeovers have served notice to all levels of management that weak financial performance is unacceptable and may precipitate a fight for corporate control. This potential loss of control has motivated many executives to better understand the importance of measuring and managing shareholder expectations. To create value, management must have thorough understanding of the performance variables that drive the value of the business. These are known as key-value drivers. There are two reasons for understanding these variables. First, the organization cannot act directly on value. It has to act on things it can influence, such as customer satisfaction, cost, and capital expenditures. Secondly, it is through these drivers of value that senior management learns to understand the rest of the organization and to establish a dialogue for goal accomplishment. A value driver is any variable that considerably affects the value of the organization. Though value drivers need to be organized so that management can recognise which have the greatest impact on value and assign responsibility for their performance to individuals who can help the organization to meet its targets. The measures available to management and shareholders to appraise a firm's value-creation performance can be categorized into three groups. In first type, measurement includes those assessments which depend on mainly on the financial statements produced by the firm, but require an estimation of the cost of capital and other adjustments to traditional income statements and balance sheets to reveal operating cash flows and an appropriate capital base. These can be named value-creation measures. The second type of measures, it includes those that rely entirely on stock market data and, thus, are mainly applicable to exchange listed companies. These can be labelled as wealth-creation measures. These measures concentrate on the impact on shareholder wealth and use that as an indirect measure of annual (or periodic). In the category of measures, there are hybrid value/wealth-creation measures and require both financial statement and stock market data. The simplicity/accuracy trade-off implied in each. Management's ability to understand and control the measures. Another measure of shareholder value creation is the equity spread proposed by Marakon Associates. This measure reflects the difference between the ROE and required return on equity (cost of equity) as the source of value creation. This measure is a variation of the EV measures (Hussey, 2007). Marakan Associates, an international management-consulting firm created in 1978, has done revolutionary work in the area of value-based management. This measure contemplates the difference between the ROE and required return on equity (cost of equity) as the source of value creation. This measure is a variation of the EV measures. Instead of using capital as the entire base and the cost of capital for calculating the capital charge, this measure uses equity capital and the cost of equity to calculate the capital (equity) charge. Congruently, it uses economic value to equity holders (net of interest charges) instead of total firm value. For an all equity firm, both EV and the equity spread technique will offer identical values because there are no interest charges and debt capital to consider. Even for a firm that relies on some debt, the two measures will lead to identical insights provided there are no extraordinary gains and losses, the capital structure is stable, and a proper re-estimation of the cost of equity and debt is conducted. In Marakan model, shareholder wealth creation is measured as the difference between the market value and the book value of a firm's equity. According to the Marakon model, the market-to-book values ratio is function of thee return on equity, the growth rate of dividends, and cost of equity. For an all-equity firm, both EV and the equity-spread method will offer same values because there are no interest charges and debt capital to consider. Even for a firm that relies on some debt, the two measures will lead to identical insights provided there are no extraordinary gains and losses, the capital structure is stable, and a proper re-estimation of the cost of equity and debt is conducted. A market is favourable only if the equity spread and economic profit earned by the average competitor is positive. If the average competitor's equity spread and economic profit are negative, the market is unappealing. The Alcar group Inc. a management and Software Company, has established an approach to value-based management which is based on cut-rate cash flow analysis. In this structure, the importance is not on annual performance but on valuing expected performance. The inferred value measure is similar to valuing the firm based on its future cash flows and is the method most closely related to the DCF/NPV framework. 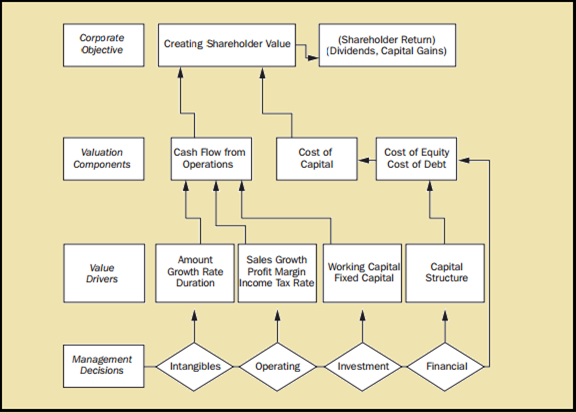 In this approach, one guesses future cash flows of the firm over a reasonable horizon, allocates a continuing (terminal) value at the end of the horizon, estimates the cost of capital, and then estimates the value of the firm by calculating the present value of these estimated cash flows. This technique of valuing the firm is same to that followed in calculating NPV in a capital-budgeting context. Since the computation reaches at the value of the firm, the implied value of the firm's equity can be determined by subtracting the value of the current debt from the estimated value of the firm. This value is the implied value of the equity of the firm. To evaluate whether the firm's management has created shareholder value, one subtracts the implied value at the beginning of the year from the value estimated at the end of the year, adjusting for any dividends paid during the year. If this difference is positive, management can be said to have created shareholder value. It is theoretically good as it utilize the discounted cash flow framework. Alcar have made available computer software to popularize their approach. Predict the operating annual cash flows over the planning period. Discount the forecasted operating cash flow stream using weighted average cost of capital. Estimate the residual value of business plan/strategy at the end of the period and find its present value. The residual value can be calculated by dividing Perpetuity cash flows by Cost of capital. Calculate the total shareholder value, which is equal to Present value of operating cash flows plus Present value of Residual value minus Market value of Debt. Establish the pre-strategy value through similar process. Pre strategy value = Cash flows before decision making/Cost of Capital - Market Value of Debt. Calculate the value created by the strategy. However, the Alcar approach has some drawbacks such as In the Alcar approach, profitability is measured in terms of profit margin on sales. It is generally documented that this is not a good index for comparative purposes. Fundamentally a verbal model, it is unnecessarily burdensome. Therefore it requires a fairly involved computer programme. McKinsey & Company, profitable international consultancy firm has developed an approach to value-based management which has been very well enunciated by Tom Copeland, Tim Koller, and Jack Murrian of McKinsey & Company. They stated that "Properly executed, value based management is an approach to management whereby the company's overall aspirations, analytical techniques, and management processes are all aligned to help the company maximize its value by focusing decision making on the key drivers of value. Economic value, shorty abbreviated as EV is used as a measure of business unit and company performance. It is increasingly prevalent presently. The evolution of EV measures can be traced to Ricardo in the mid-1800s who used the term super normal rent to define EV. In the period of mid-1920s, General Motors used a measure called residual income to indicate the amount of income left over after paying for the various components of costs including a charge for capital. Consulting firm Stern Steward has created the idea of Economic Value Added. Corporations of various industries the EVA badwagon. Economic Value Added is a valuable tool to measure the wealth produced by a company for its equity shareholders. It can be said that it is a measure of residual income after meeting the necessary requirements for funds. Economic Value Added is fundamentally the surplus left after making an appropriate charge for capital employed in the business. It may be calculated by using following equation. Economic Value Added is net earnings in excess of the cost of capital supplied by lenders and shareholders. It represents the excess return (over and above the minimum required return) to shareholders; it is the net value added to shareholders. It is a performance measure that ties directly, theoretically as well as empirically, to shareholder wealth creation. It translates accounting information into economic reality that is readily grasped by non-financial managers. It is a simple yet effective way of teaching business literacy to everyone. It serves as a guide to every decision from strategic planning to capital budgeting to acquisitions to operating decisions. It is an actual tool for investor communication. -	It is closest in both theory and construct to the net present value of a project in capital budgeting, as opposed to the IRR. -	The value of a firm, in DCF terms, can be written in terms of the EVA of projects in place and the present value of the EVA of future projects. There are numerous challenges in the actual calculation of all of the economic value measures. These challenges rise because the actual calculations may require that exact estimates of the cost of capital be derived and several adjustments to the financial statements be made. Actual economic value of a firm or a business or a project or any strategy depends on the cash flows and the suitable discount rate (commensurate with the risk of cash flow). There are various techniques for calculating the present value of a firm or a business/division or a project. Estimate the firm's unlevered cash flows and terminal value. Determine the unlevered cost of capital. Discount the unlevered cash flows and terminal value by the unlevered cost of capital. Calculate the present value of the interest tax shield discounting at the cost of debt. Add these two values to obtain the levered firm's total value. Subtract the value of debt from the total value to obtain the value of the firm's shares. Divide the value of shares by the number of shares to obtain the economic value per share. Economic value of equity = Present value of equity cash flows + Present value of terminal investment. It provides a long term financial view on which to base strategic decisions. It provides a universal approach that is not subject to the particular accounting policies that are adopted. It is therefore internationally applicable and can be used across sectors. It forces the organization to focus on the future and its customers, in particular the value of future cash flows. One major drawback of the tendency of corporations to focus on maximizing shareholder value is that it can lead to poor or unsustainable business practices. Another disadvantage of shareholder value analysis is that estimation of future cash flows, a key component of SVA can be very difficult to complete precisely. This can lead to incorrect or misleading figures forming the basis of strategic decisions. Development and implementation of the system can be long and difficult. Management of shareholder value requires more complete information than traditional measures. It has been observed that companies which concentrate on maximizing shareholder value might lose focus on what customers want, or might do things that are not optimal for customers. Other harmful effect of shareholder value maximization is that it can unhappy employees. The lower corporation's costs, the more profit it stands to make if its total revenue is constant, so corporations can benefit from cutting employee benefits and wages. If domestic labour is not inexpensive enough or not productive enough, businesses can outsource labour to foreign workers who are willing to work for lower wages. To summarize, the shareholder value creation approach assists to support the competitive position of the firm through concentrating on wealth creation. It offers an objective and consistent framework of assessment and decision-making across all functions, departments and units of the firm. It can be easily applied since cash flow data can be obtained by appropriately adapting the firm's existing system of financial projection and planning. The only extra input needed is the cost of capital. 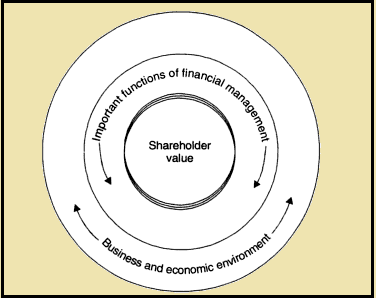 The acceptance of the shareholder value creation approach does require a change of the attitude and educating executives about the shareholders' value approach and its application.